Well I broke down and bought a TV. I had been tossing around several possibilities, but in the end I found the Olevia 32" LCD 232V HD TV on sale at Circuit City for $599 and started thinking that if I could get the price down some more it would be an easy decision for me to buy it. I was drawn to the TV for a couple reasons - HD is nice to have and I am willing to pay a little more for it (but not much) and my living room is on the small side so getting a TV that I could potentially hang on the wall would make the room much more spacious. By dumb luck (or fate I guess) I found a couple ways to save some money on my purchase. 1) 10% off TVs Circuit City coupon - The USPS Change of address packet comes with some Circuit City coupons including a 10% off TVs (even TVs that are on sale). 2) Discover 5% Get More Promotion - Discover Card was offering 5% cashback on purchases from Circuit City and a few other retailers. 3) Discover Mall Promotion - get $20 gift cards for every $200 in purchases on Discover Card. This basically gives me 10% back in gift cards. 4) Miller Lite Electronics Beer Rebate - A holiday tradition of mine, I found a beer rebate for $25 off a electronics purchase of $75 or more. After finding all these discounts I finally bit. Net Cost: $462.62 for my Olevia 32" HDTV. At that price it was less than $200 more than a standard definition TV of the same size and given the HD and space saving benefits it seemed like a wise purchase for me. Seems like a very good deal. 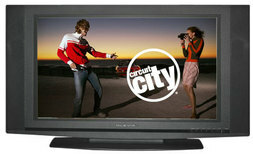 Circuit City is also offering a 125% pricematch on any TV right now as well if you happen to see it cheaper at a local store over the next 30 days. Though since you used the 10% off coupon they will probably fight you tooth and nails on actually honoring it. Good find. Getting good content is key. Does it have a built-in HD tuner? Yup - built in HD tuner. I am going to hold off on the HD service for now - going to try over-the-air broadcasts. Nice find. Good choice getting an HD equiped TV, you won't regret it even if you don't subscribe to the service (not worth the $ in my opinion). Is there a reason you decided to not post my comment? If you cannot take criticism, you should not be blogging. I have posted on your site before with helpful information, but now I see you are censoring my post(s). No worries Ray - I respect you opinion! Feedback for anyone thinking about purchasing this TV. For $463, I am loving it - couldn't be happier given the price. The only dislike I have about the tv is using the remote to change channels on the TV HD tuner. I have the tv HD tuner using an external antenna. When I try to change the channels on the tv, there is often a varingly delay between the tv responding and changing the channels. Enough so that sometime you press the remote again because you think that it didn't pick up the button press and then the tv jumps past the channel you were trying to change to. This is the only issue I have had with the tv. I just purchased a 42" LCD for a net cost of $679. Yes, it's a lot more than you spent but still a bargain considering the original retail price of $1200. I also used a little bit of accounting fraud by offseting a protion of the cost with proceeds from the sale of the 7 year old tv it replaced.